Are you a member of the Pre- Physician Assistant Club, Allied Health Professions Club, or Biology Club at your school? Email us to learn more about setting up a free TIPS seminar at your school! Our program has gotten rave reviews from students eager to learn more about becoming a successful Physician Assistant. Not a member of a club at your school? No problem – email us anyway, and we’ll talk to your advisor about setting up a program. April 21, 2018 (all day): Kean University Biology Club Career Conference – free and open to the public! March 9, 2017: at Rutgers University. This event is free and open to everyone! October 29, 2015: 5pm ONLINE! Watch a recording of the webinar Creating A Stellar Narrative! September 25, 2015: 4pm ONLINE! Watch a recording of the webinar Optimizing your PA School Interview! April 25, 2015 at Kean University Biological and Health Sciences Career Conference.View photos! March 23, 2015 at Gabriele’s. View photos! February 19, 2015 at Rutgers University. The event is free and includes dinner – no need to be a Rutgers student to attend. View photos! On behalf of the Rutgers University Allied Health Professions Club, we would like to offer our sincere thanks and appreciation for presenting to our organization on Monday, November 3rd on the Busch campus. The presentation was not only informative, but also interesting as you brought in real-life examples from your practice as a physician assistant. Everyone who attended seemed to really take something away from the program. 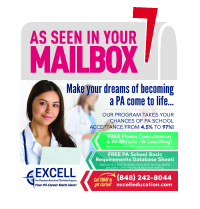 After having received feedback from our members, we have only heard positive things about the clerkship informational session, especially about the 100% acceptance rate to PA school. Having been the president of the organization for two years now, I cannot begin to tell you how often I am asked about how to obtain shadowing and healthcare experience from prospective PA students. Up until now, I have always told individuals that they should resort to searching the internet for PAs and contacting them directly, or to go through friends and relatives, neither of which is often successful. This program is the answer for that and I will be glad to point them in the direction of EXCELL in the future. Furthermore, one of the most frustrating things about running an organization is that often, we will set up events only to have a few people show up. In the case of this event, there was no shortage of attendance – which further shows how much of a need there is for this type of clerkship program. If your schedule allows, we would love to have you come again in the future to present to our members on a semester or early basis….Thank you again for your time and your commitment to helping the pre-physician assistant students gain the experience and prerequisite requirements that the need to start the application process. *PAEA-Program Repoort 31 (2014-2015; updated June 2017).